Download the LEGO NXT Program from the download section and extract the files from the zip archive. Copy the icon file named “RR Icon.ric” to where your Mindstorms is installed, in the Pictures folder (on Mac usually located here: Applications\LEGO MINDSTORMS NXT\engine\Pictures and on Windows it is usually here: Program Files\LEGO Software\LEGO MINDSTORMS NXT\engine\Pictures). The NXT program can then be installed using your Lego Mindstorms Software supplied with your Lego Kit: simply double click on the RoboRemote.rbt and it will open with the Mindstorms Software, then click on the Download button (we recommend using an USB connection – it is faster, more reliable and consumes less battery). If you use bluetooth for the file transfer to the NXT then make sure you close the Mindstorms NXT Software after the download is complete, before you try and connect to the NXT from the RoboRemote Server. This is the step where you connect the iPhone to the MAC/PC/Android. It requires a few additional steps described here. After you make the connection come back here and follow step nr 5. You are now ready to drive! While all the connections are made iPhone->Server->NXT you can switch between the remotes on the iPhone without the need to reconnect. If you encounter any problems trying to create the connections go to our troubleshooting section on the bottom of the page for more details. 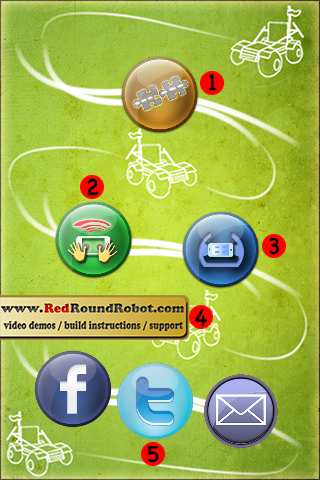 Wheel Orientation : this is the interface feedback based on the wheel turning commands received from the RoboRemote on the iPhone. There are three turning points to the left, three to the right, and one for driving straight. The light turns green when a turn command is received. 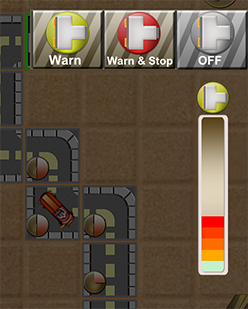 Speed Indicator : the acceleration gauge updates as it receives speed change commands. There are five different driving modes: four incremental forward speeds – green meaning the slowest and red the fastest, and one speed for driving backwards. Proximity Sensor : pulling the slider up or down simulates getting closer or further away from an obstacle. Middle means that it is far enough so that no obstacle is detected. Pulling up simulates getting closer forward, and pulling down simulates getting closer backwards. Battery Level : pulling the slider up or down simulates the battery charge level. The RoboRemote App will update it’s UI based on these charge levels. If Auto power boost is selected on the iPhone then the power boost level will also change based on the battery charge levels. Catapult : the UI of the server will change based on the slider bar position of the catapult on the iPhone. Change ball color : the ball color shown on the iPhone when the Catapult or the Shooter menus are selected can be changed by clicking the buttons in this area. This simulates the color sensor detection on the NXT. Shot : this image is animated when the Shooter or the Catapult “shoots” on the iPhone. Proximity sensor mode : switch between using the motor on port C to move the sensor in the direction the car moves (moving state), or just place the sensor anywhere you want, no motor needed (static). All of these new options are active only when the corresponding option is active on the iPhone. Puzzle Drive Remote : tap this button to start the Puzzle Drive Remote. You will drive your NXT Car on your own piece by piece build tracks. Air Drive Remote : tap to start the Air Drive Remote – drive your NXT by moving the iPhone through the air. Each of the three remotes have an “Info” button in the RoboRemote App with in depth usage details. Only one option between this three can be used at a time: the ball gun or the catapult or the proximity sensor (when the “Moving” proximity sensor mode is selected on the server). The same motor port and the same sensor ports are used, but the motor will behave different depending on the current option! So make sure you use the correct correspondence between the selected option on the iPhone and the build instructions! 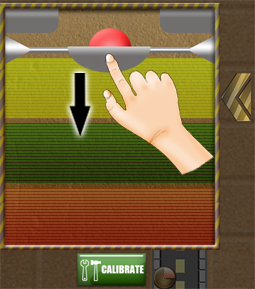 Calibrate : tap this button to start the calibration process. The shooting axel will be placed in the optimum start position. It is important that you always do this calibration every time you rebuild the ball gun. And it is also important to first remove the balls from the ball holder to avoid any damage during the calibration process. Shoot : tap to shoot the ball. Ball color : this is the color of the current ball that can be shot as detected by the color sensor. Slider : pull the slider down and over the three zones indicated by yellow green and red and watch how the catapult moves back preparing to launch its load. The shooting range gets bigger by moving from yellow to red. After you have decided on the shooting position release the slider and watch the ball fly through the air. Calibrate : tap to start the calibration process. The catapult arm will move in to the correct starting point. 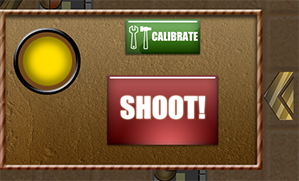 After the calibration is complete you can place the ball in the catapult and start shooting. It is important that you calibrate the catapult each time you rebuild the catapult, or if you happen to move the catapult arm by hand. Ball Color : the ball color will change if the color sensor detects a new color. To change the color you need to keep the ball in front of the sensor until the color changes. As the batteries run out the motors receive less voltage so as a result they run slower. So this option enables you to boost up the power to compensate for the lower battery level. Auto : use the auto feature to let the RoboRemote app decide the needed power boost based on the current battery level. If the battery level is good enough, no boost will be applied. As the battery discharges it will increase the power boost as needed. Off : No power boost will be applied to the drive motor. 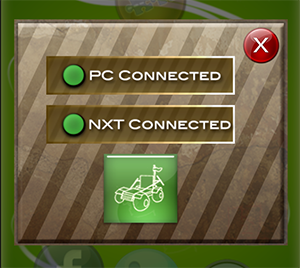 Detect incoming obstacles and tell the NXT Car how to react. Warn : if you choose this setting the iPhone will indicate visually by different color levels in the sensor area on the screen as it approaches an obstacle. If it is too close then it will also vibrate but the car will keep moving. Warn&Stop : the same as the Warn option, this will also indicate visually and by vibration if it gets closer to objects or further away but if it gets too close then the car will stop. The car will only be able to move in the opposite direction of the obstacle detected, preventing the car from hitting the near obstacle. Off : the proximity sensor is turned off and there will be no indication (visually or by vibrations) of incoming obstacles. Moving : select this state if you want your sensor to turn forward/backward as you drive. This mode requires the build instructions found in the build section: the sensors and the motor must be connected to the right ports. Static : select this state to place the proximity sensor anywhere you like on the car. No need for the third motor or the push sensor to be connected. Just make sure you connect the proximity sensor on the nr.4 port. The RoboRemote App connects to the PC/Android using WiFi signal so it is important that you are on a WiFi network when attempting to establish the connection. Also the signal must be very strong otherwise there might be communication delays.